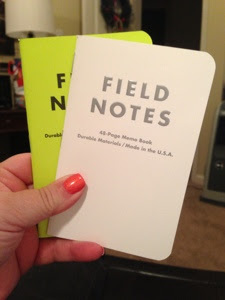 My brother-in-law, Gary gave each of us Field Notes booklets for Christmas this year, reminding us of how Jake used to carry a tiny notepad in his shirt pocket to jot down anything and everything he found interesting, or thought would be useful at some time or another. He had Ashley's skating events marked, with what place she took in that event, what grades she got, graduation dates, how much each of the grandkids weighed at birth... all kinds of stuff. Writing with pencil to paper has become a lost art, with the invention of a phone that keeps your notes, contacts, email, internet, etc all in one place. I really became attached to this idea immediately, blurting out at Christmas, "we should bring these back next Christmas and share what we wrote this year..." getting a hardy "YES!" from Gary. 1. Get rid of 50 things. You all know how much stuff we sold or gave away when we moved. I still feel burdened by STUFF. I am going to find 50 things to remove from my life this year. 2. Exercise. Blech. I wrote it down so I must want to do it deep down somewhere. 3. Organize my study. I see all these great organizational ideas on the ThirtyOne website, or at The Container Store... but I have two desks in this tiny study stuffed with things and papers and junk. Gotta organize it once and for all. 4. Rework my wardrobe. My clothes are just coverings for my body so no one runs screaming from me at school. I have to apply myself here and try a bit harder. 7. Volunteer. New Town is full of opportunities to help. Just gotta jump in. 8. Take the 21 day Relationship Challenge with The Happiness Project. Signed up and waiting for the first challenge. 9. Learn more about my camera. I fiddle with it all the time but actually knowing what each setting means and does isn't there. I got a great lens for Christmas. Gotta learn how to come up with some great photos! 10. No cell phone at dinner time, except to take pictures of food! 11. Read at least 25 books and find a book club! 12. Visit a new city. This one is harder. Gotta think about my possibilities and how I can get this one in! 13. Have a picnic. Used to do this all the time and have not done one for awhile. With all the beautiful gardens around here, shouldn't have any trouble with this! Just think, this all started with a Field Notes notebook. Can't wait to see how else it will inspire me! This fits right in with my word for 2013 which is WRITE. I want to improve my writing and with the dissertation coming along, this is the perfect year for this! Those are some really great things to do in 2013. I love the no cell phones at dinner. We are planning to stop watching the news at dinner so we can actually talk again. Many good blessings with all the items. Let us know how you are progressing with them. Hi Terri! Long time no see! :) I LOVE your list !!! You are a girl after mine own heart. Except for the disseration, that could be my list, too! I always start the NY off with lists of what I didn't do well to prepare for the holidays...(and this year, had I not decided to not be so hard on myself, that list would have taken up many of those little field notebooks...not a good holiday season in many ways...except for the important parts). I then start listing goals for me, the house, etc. and I have SOOOOO many that I overwhelm and disappoint myself. So, most don't get touched. Thus...I love limiting them to 13! I also need to get that app on my phone....I love the idea of documenting daily my life via pix!